Built between the thirteenth century and 1520, it is regarded as one of the prototypes of Brabant High Gothic. The original furniture was lost during the religious quarrels of the sixteenth century and were replaced in baroque style. 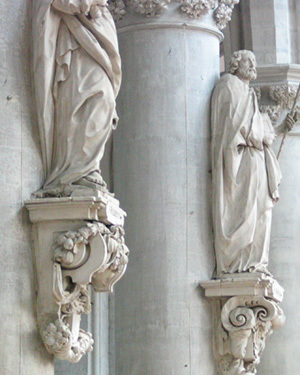 The church contains a large number of works of art, among which Anthony Van Dyck (Christ on the Cross), a series of panels from the thirteenth century picturing the legend of Rombout (Rumoldus), a remarkable main altar by Lucas Fayd’herbe among others and memorial stones. A carillon with 50 bells hangs in the tower.